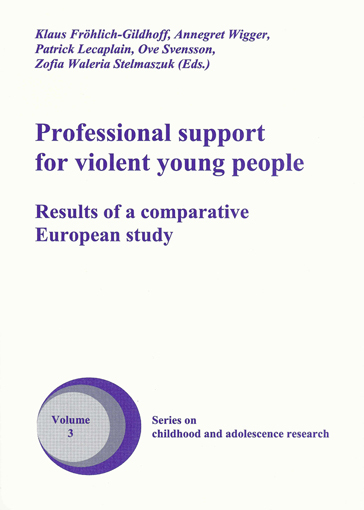 In the European countries, a lot of different help offers for families with violent acting children and adolescents exist, in general financed and organised by governmental institutions. Respectively, different systems (youth welfare, school, health, justice) are responsible for the target group. These varying responsibilities can be explained by different traditions dealing with problematic behaviour or by different national structures. In a comparative research project within the Daphne II programme of the European Commission, partners from Germany (ZfKJ Freiburg), France (IRTS Rennes), Sweden (University Halmstad), Poland (University Warsaw) and Switzerland (FH St. Gallen) worked together for two years. The project aimed at the analysis and comparison of ambulant help offers for violent children and young people and their families. As on result, common quality criteria for best practice could be figured out. The book addresses practitioners working with violent acting children and adolescents and their parents in different fields, as well as students, lecturers and researchers.